I am always on the lookout for a reason to make a fancy cake. I keep bookmarking cool looking cakes and the list of things I want to try with frosting keeps getting longer and longer. Unfortunately, now that I live in San Diego and most of my family/friends are 2,000 miles away, it’s not often that I have a good reason. Don’t get me wrong, I’m happy to whip up a random batch of brownies, cookies, or simple cupcakes for no reason at all. But the fancy-stuff really needs an occasion (hence the over the top cake I made for my own birthday). So when I realized that there was a birthday for a special 12 year-old the first weekend I was back from China, I was overwhelmed with cake ideas. This is where the rosy ruffle cake comes in. 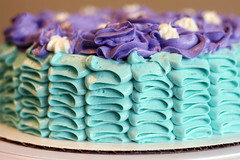 Ruffle cakes have been popping up all over the blogosphere for a while now and I am jealous of each and every one. Then a few months ago I saw a gorgeous rose covered cake and I wanted to make that too. Since cake making opportunities are few and far between I decided to combine the two. The birthday girl requested teal blue and purple. 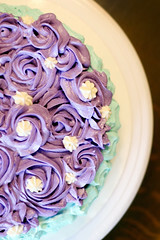 I still want to try a baby pink ruffle cake but this combo was pretty cute too. Now on to the frosting. This recipe is weird, flour in frosting? I was skeptical, but, it’s been something I’ve thought about trying for a while. The texture was smooth so it was ideal for the ruffling but maybe too soft for the rose swirls. It also had a light fluffy feel when eating and the taste was sweet but not too sweet. It is officially going into my frosting recipe rotation and I know I will use it time and time again. *I doubled the recipe for this particular cake. At this point you can color as desired with food coloring. Sorry no tutorial on the ruffles, I have only done it this one time and I am no expert! I did however watch this video to get the general idea. As for the roses, I started a little off center and made a big rose swirl (with Wilton tip 1M) and continued making roses around the cake until it was mostly covered. Then I went back and added stars to fill in gaps. 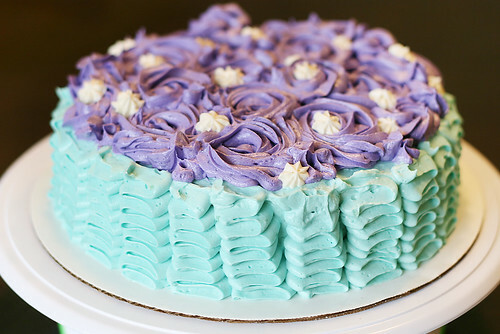 >OMg..I tried making this same frosting and I totally failed at it! my texture was so off! You did a great job!! Maybe I will give it another go. The taste was unique and I liked that it was not overly sweet. >This cake is decorated so so beautifully, i have always wanted to try that floury frosting recipe after it was praised so highly by Ree but have yet to. After seeing your gorgeous cake though i DEFINITELY need to just DO it! >Great job! This frosting recipe is really unique! Im going to have to try this on my next cake! >Awwww…that looks beautiful. I love your piping techniques, so lovely. Hmmm I can't wait to try your recipe *bookmark it*. One thing that I think is key is to really just beat the crap out of it. There was definitely a point where the texture was… weird. Good luck if you try again!